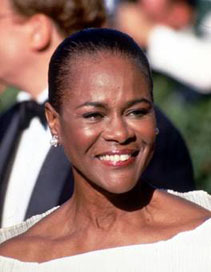 Cicely Tyson owes her career to a good haircut. In a beauty salon, her hairdresser asked Tyson to model at a hairstyle show. At the hair show, she was spotted by a photographer from Ebony magazine, and began her successful career as a model. Within a few years, she was among the most successful black models in America. Tyson made her stage debut in a mid-1950s YMCA production of Dark of the Moon, and her first film was an uncredited role in Carib Gold with Ethel Waters in 1957. In 1963 she played George C. Scott's secretary in a gritty drama about social workers in Harlem, East Side/West Side. The show had abysmal ratings, and was canceled midway through its first and only season, but Tyson's was the first black female character in an American TV series who wasn't written as a nanny, maid, or menial worker. In 1966, she joined The Guiding Light, becoming one of the first black actresses to win a regular role on a soap opera. In 1972, she starred with Paul Winfield in Sounder, and was nominated for an Oscar. She won Emmys for The Autobiography of Miss Jane Pittman and Oldest Living Confederate Widow Tells All. She has also played Coretta Scott King and Harriet Tubman. In the camp classic The Concorde: Airport '79 with Robert Wagner, George Kennedy, and Charo, Tyson played a mother rushing a heart to her ailing son. In 1983, Tyson appeared on Broadway in a production of The Corn Is Green which was poorly reviewed and closed after only two weeks. She was fired when she took a night off to attend a tribute to her then-husband, jazz musician Miles Davis. Tyson sued the producers, maintaining that she was entitled to payment in full as stipulated in her contract, about $750,000. The case and appeals took 15 years, but Tyson won. Hollywood Walk of Fame 21-Aug-1997 at 7080 Hollywood Blvd.